This is a quick-fix update for macOS users only. 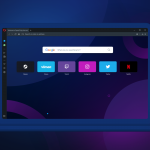 Some of you have had problems with Opera crashing. Today’s update, in which we straightened out an issue with tabs, should fix this problem. The changelog offers additional specs on updates and fixes.